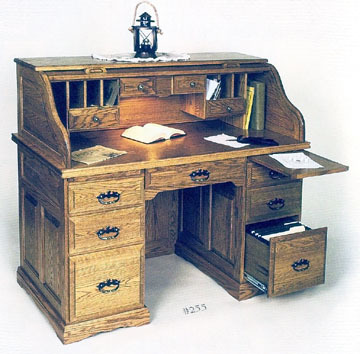 Have you been looking all over for a top quality solid oak roll top desk? Well here is your chance to get one made to the top quality standards of the finest Amish craftsmen. Made by the Amish of solid oak hardwood, our roll top desk features two file drawers with heavy-duty metal roller slides, four small drawers, a center drawer and four mini-drawers. You also get 6 small pigeon holes and 2 large ones, two pull out work surfaces, a full modesty panel, and a lighted workspace on the desktop, all in a beautiful raised panel oak design with antique hardware. Of course we mustn’t forget the main attraction of our desk - that the entire desktop can be covered by the oak roll top cover. This is truly an incredible piece of Amish Furniture that you will be able to pass down for generations!